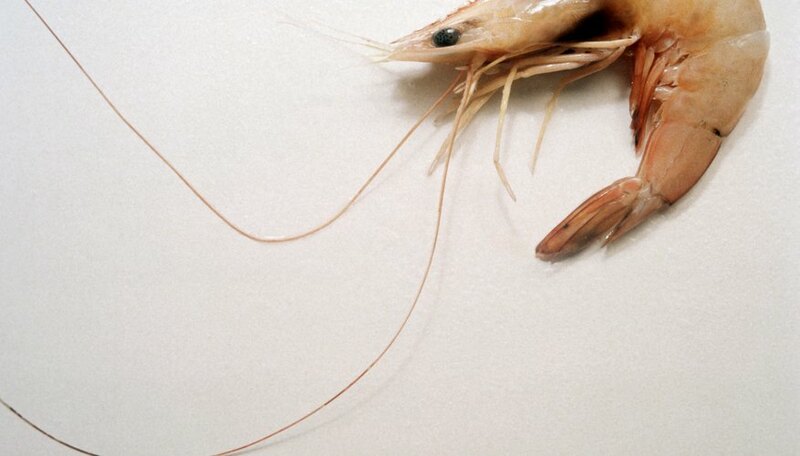 Like their fellow invertebrates, shrimp lack the internal skeletal system found in such classes of animals as mammals. This means that shrimp possess no backbone, or vertebral column, encasing a spinal cord. It does not, however, mean that shrimp are without a nervous system. One perhaps surprising detail about shrimp anatomy is that, like the human nervous system, the shrimp nervous system includes as a subdivision a central nervous system, where much of the information gathered is processed. As with humans, the main processing organ in the shrimp central nervous system is the shrimp brain. The shrimp brain is much smaller, composed of only a few nerve cell clusters, or ganglia. It its found on the back, or dorsal, side of the shrimp's head. The central nervous system's other major component is the nerve cord. In humans, this bundle of nerves extends from the brain down the back and is encased by the spine, and so is called the spinal cord. In arthropods like shrimp, the unenclosed nerve cord is split into two long portions that descend from the brain along the belly, or ventral, side of the body. Ganglia and nerve fibers reaching across these two portions give the nerve cord a laddered appearance. The nerves branching from the nerve cord help the shrimp gather information from its sensory organs. A shrimp's sensory organs are numerous: olfactory receptors to help it detect pheromones, fibers lining its legs to let it assess its environment through touch, even a sensory dorsal organ that somehow complements other organs' actions. Easiest to observe are the shrimp's eyes, compound eyes situated at the end of stalks, which allow shrimp to perceive color and light invisible to humans. Whether information is coming from the sensory organs or going to the body's muscles, the cells of the shrimp's nervous system need to communicate with other cells. To send messages, they rely on hormones and neurotransmitters. Shrimp, like humans, have a cholinergic nervous system, meaning that neurons communicate using a chemical called acetylcholine. Shrimp body functions also employ the hormone serotonin, which improves mood in humans. Shrimp with elevated serotonin levels have been shown to swim toward bright light. Cell and Tissue Research: Existence and Distribution of Gonadotropin-Releasing Hormone-Like Peptides in the Central Nervous System and Ovary of the Pacific White Shrimp, Litopenaeus vannamei. Johnson, Sheila. "Do Shrimp Have a Nervous System?" Sciencing, https://sciencing.com/shrimp-nervous-system-17846.html. 03 August 2018.